Can anyone explain to me why men (at least some of them) act like they are dying when all that ails them are a mild case of tummy flu, a cold or something common like that? Gahhh, what is a hip replacement when compared? Bitchy bitchy me! and the monofilament thread from time to time, get all bird nest (on the back) on me. Have tried to change the thread tension, but I think I have to pay more attention on where I go. 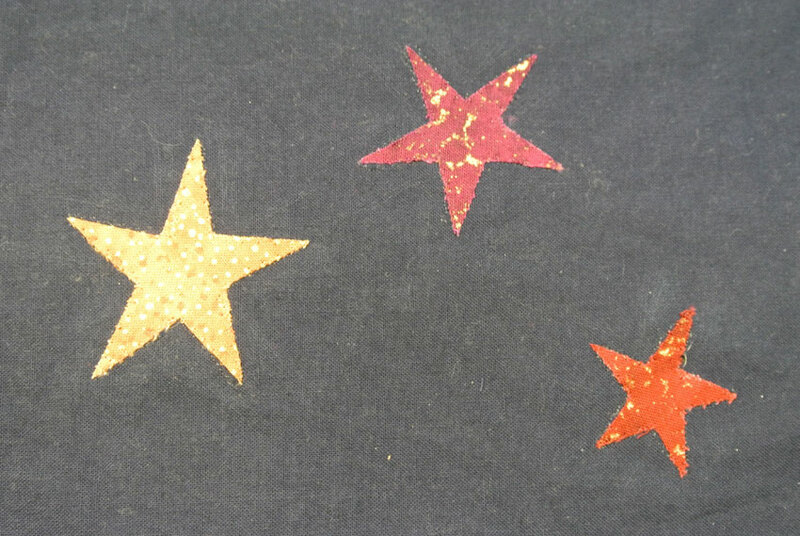 There is one more part to successful appliques with fusible…. You need a stabilizer on the back of the top behind the applique bit. You can use paper or a tear away, I use one by Pellon… when you are stitching down the stars… I wouldn’t worry about the needle holes, they will go away… with pressing or a short tumble on warm in the dryer. For the monofilament thread you are going to need a large eye needle (either Microtex, Topstitch or Embroidery).